Make a foundation chain of 35 chain stitches. *hl – half leaf – yarn over (yo), insert the hook into last side stitch developed from the hdc, grab the yarn and pull it through. You should have 3 sts on your hook. [Yo, insert the hook into a chain of the 3 arc chains of the previous row, grab the yarn, and pull it through] 3 times. You should have 9 sts on your hook. Yo, insert a hook into a hdc chain of the prev. row, grab the yarn and pull it through. You should have 11 chs on the hook. Last time, yo and pull the yarn through all the 11 sts. 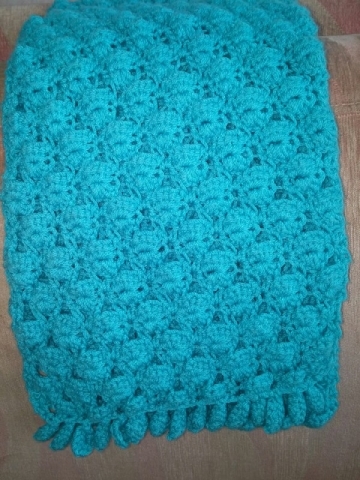 Repeat the pattern starting from the 1st row until you crochet the desired length of the scarf. Work the last row as the 1st one. 1st row – h4ch, sl.st.1, [make 7 chains (foundation chain). Insert the hook into 2nd ch. from the hook, sl.st. 5 (do not work the very last chain). Then use the second loop of the last used chain and pull the yarn through to work on the opposite side of the foundation chain (in the round). Work sl.st1, sc1, hdc1, sc1, sl.st.1, ch1. Use back loops of the sl.sts, sl.st.1, sc1, hdc1, sc1, sl.st. 1. Work sl.st.1 in the very last chain, sl.st.1 in the base chain, and sl.st.1 in the following 2 base chains] repeat that to end of the row. Cut the yarn and fasten it off. On the other side of the scarf, attach the yarn and work leaves to end. This is absolutely stunning!! Your work is magnificent and so beautiful. I can not wait to try this pattern and I thank you so much for sharing your pattern along with the video and written instructions. Have a blessed day! Thank you for the comment. Happy crocheting! Thank you for sharing with us your very impressive work. The choice of the yarn and color is excellent. Congratulations! What was so confusing about the scarf pattern? Which step was not clear/understandable for you? Thank you in advance for your reply. I like your second scarf just as the first one. Your work is very beautiful and accurate. Thank you for sharing your crochet projects with us. I appreciate it. Happy crochet!